Everyone (well almost) is addicted to technology these days. It's a part of our lives whether we want it or not. Going "off the grid" has come to mean not using your handheld for 24-hours rather than living without a connection to the electrical grid. Even Stick Tail has an iPawd. Wayne and I were talking this morning about the impact technology has on the quality of life. Laura Newcomer wrote an article that sums up many of our feelings. Our choice of living off the grid (technologically and electrically) makes sense for us. We can have a home embedded in nature where we can enjoy our surroundings and each other. We have a old flip phone with an external antenna on the roof. No 3G, let alone 4G. That means no Internet (and all the time it consumes). Yes, we could get television, phone, and Internet via satellite, but that isn't something we want in our float cabin lives. We get enough of that when we make our trips to town. For now, it's a perfect compromise. And all of our devices can be recharged using our "off the grid" solar system. We've had fog every day for over a week. When it was high, it lasted all day and night. When it was down at water level, it burned off each afternoon to give us a sunny and starlight respite. 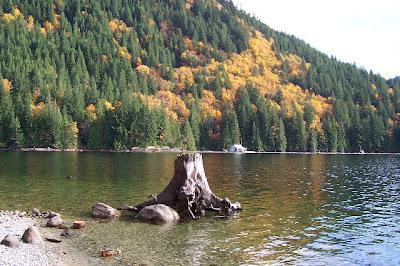 Right in front of our cabin, Goat Island has a superb display of maples turning yellow and orange. The swath of glorious colour paints up the hillsides through stream carved gullies and across expose rocky slopes. Have you ever wondered how this colourful display occurs? We just took a ride to the head of Powell Lake in our new boat. Here she is next to one of the crew boats at the logging dock. She looks like she really belongs with the working guys. At home in our cabin, we can hear the crew boats heading up the lake at about 6:30 am. Then around 5:00 pm, we see them heading back home. We found five boats up at the head of the lake. It was close to quitting time, but after we arrived, we saw four logging trucks dump their loads into the log pond. We passed the tug hauling a boom of logs to the south end of the lake. He left the head at about 2:00 pm and didn't pass our cabin until 9:30 am the next morning, and he still had another 10 miles to go. That's one long run! Have you ever seen a log dump? Here's a short video. I have to be honest. I'm not expert at canning. I've made jams, preserved berries, and a few pickles. I found this recipe in a magazine, but altered it to make a single pint of refrigerator pickles, just enough for Wayne and I to enjoy as a special treat. Heat water in a canner or tall pot to boiling. Sterilize canning jar, ring and seal. Heat vinegar, water, salt, and sugar together until boiling. Put a clove of garlic, chili pepper, and a sprinkle of dill in the bottom of a sterilized one-pint canning jar. Wash, trim, and pack raw green beans tightly into the jar leaving a 3/4" space open below the rim. Pour the hot liquid over the beans leaving 1/2” headspace at the top. Put on canning lid and tighten ring firmly. Process the jar for 10 minutes in a boiling water bath. Keep the jar off the bottom of the pot, and make sure the boiling water covers the top. Remove carefully and let cool. Store in the fridge for at least one week to allow the flavours to blend. Once opened, the jar will keep for one month in the fridge if the hot and tangy Garlic and Chili Pickled Green Beans last that long. 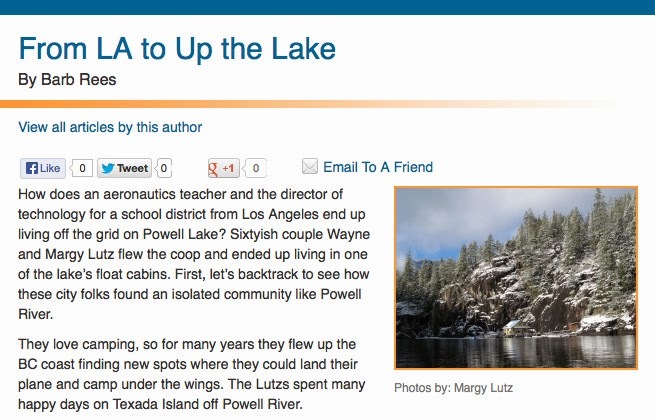 Every once in a while, the story about how Wayne and I came to live in a float cabin on Powell Lake hits the press. Not long ago, I was approached by a good friend here in Powell River. 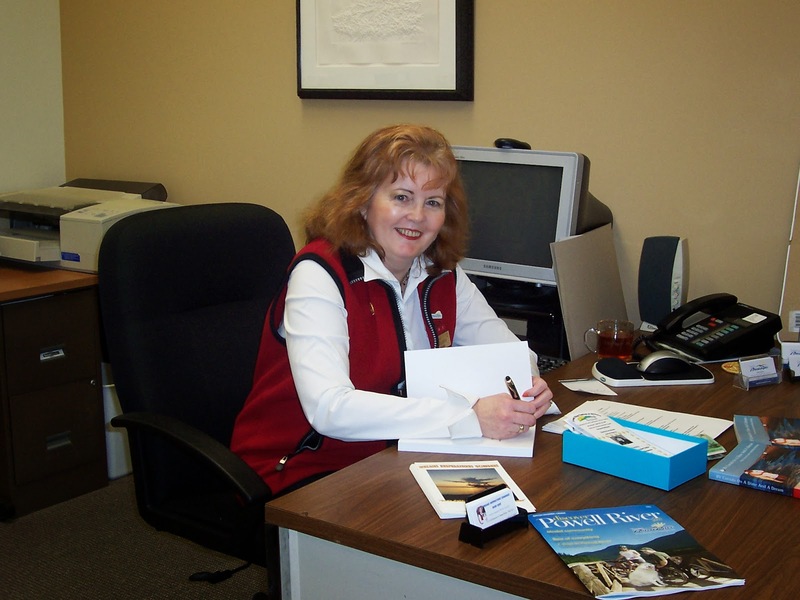 Barb Rees is a local author. In addition to her books, she also writes articles for magazine. 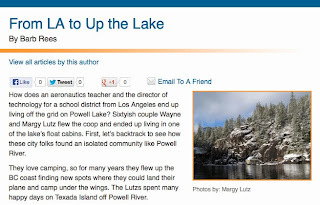 Here's one she recently submitted to Senior Living Magazine: From LA to Up the Lake. Thanks Barb. It was fun to work with you on this project. As you know, I love to visit thrift stores. I always go to the Hospital Auxiliary Economy Shop when I'm in town on a weekday, but on Saturdays, the MCC Thrift Store is open. It's operated by the Mennonite Central Committee and profits are used worldwide to help provide basic human needs such as water, food, shelter, education, and health care. It's a good addition to our thrift store options in town. I always carry a list of items I need at the cabin and watch the thrift store shelves. For the last month, I've had "teapot" on my list. The evenings are cooler and I enjoy a cup of camomile tea before going to bed. I have a coffee pot and two additional pots I use to boil water for drinking and cooking, but I hate to tie up one of those for my evening tea. I wasn't picky about what could work as a teapot, but last week I found the perfect one at the MCC Thrift Store. It only cost 50 cents, and a bit of Comet made it looking like new inside and out. Whether I'm using the propane range or woodstove heat, it keeps my tea warm and ready to drink throughout the evening. Some vegetables are in their prime in the fall, especially in northern climes. I planted my tomatoes in June from starts I got at the nursery. They grew throughout the summer and finally had tomatoes setting in August. I was able to pick my first ripe tomatoes in early September, but the majority were still green when it was time to leave for our trip to Arizona at the end of the month. I returned two weeks later. I was rewarded with tomatoes ranging from still green to perfectly ripe. The ripe ones were just as good as the ones that came off the vine. The rest are continuing to ripen. My experiment was a huge success. I'm a horse lover from way back. Whoever nicknamed these clouds mare's tails knew both their skies and animals well. These are terms for fog that forms over water. Over salt water it's called sea smoke, over fresh water it is called steam fog. It happens when colder air moves over warmer water. This time of year, you can see steam fog rising from John's back bay and moving out over the lake's surface. Recently, when we had a sudden thunderstorm with hail, steam fog formed immediately after the deluge stopped. Even with the hail melting on the lake's surface, the air through which it passed must have cooled even more. 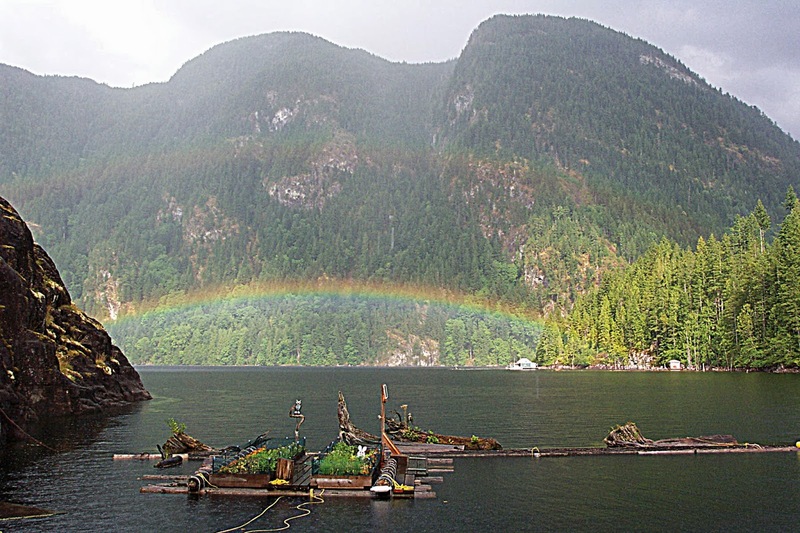 On calm days, it can be very tranquil out in First Narrows. Gentle ripples in the water become mirrors to reflect the sky. They make a picture better than any artist could create. From up on the cliff on a sunny day, it looks like my garden is floating in the sky rather than on the lake. Every company needs a logo. It allows for quick product recognition by customers. When Wayne and I created our company Powell River Books to publish his Coastal BC Stories, we wanted a logo that was meaningful to us and the books he was writing. We started with one of our favourite pictures from up the lake at our float cabin. That made a lot of sense, because the first book in Wayne's series was Up the Lake. That's a term you hear a lot around Powell River, especially in the summer. Wayne is handy with a computer. He took the colour photo and used Photoshop to create a three colour image. Voila, our logo was born, right down to my floating garden in the foreground. Now we use it in all of our online signatures and printed materials. We even had T-shirts made with our logo on the back to give away are events like Sea Fair and the Blackberry Street Festival. You know we love our float cabin home in all seasons, but everyone needs a little sunshine when the clouds and rain roll in. Many Canadians become Snowbirds in the winter months. They head out in RVs or to part-time residences in places like Southern California and Arizona. We wouldn't leave our cabin home for a five or six month stay elsewhere, but a long weekend trip makes a nice sunny interlude. Last weekend we followed the USC Football Team to Tempe, Arizona, to battle with the Arizona State University Sun Devils. We arrived three days early to get some fun in the sun, and a mega-dose of Mother Nature's Vitamin D. We took a desert walk at nearby Papago Park with a quick visit to the Desert Botanical Garden. And of course worked on maintaining our Powell Lake summer tans. We went to a pep rally before the game at Depot Cantina, especially to hear the USC Marching Band. That was quite the place with USC and ASU parties next to each other. Then it was a short walk to the stadium. This year it was a night game, so we didn't have to bake in the sun. But it was hot on the field, with ASU winning 62 to 41. Even so, it was a good game. Fight on, Trojans!